The gorgeous flourish from Creative Elements is perfect for creating a subtle, delicate background. I used Soft Sky ink (something blue!) and coloured it with an aquapainter. Then it was time to add some shine! The ornate frame was stamped onto vellum and heat embossed with gold embossing powder for an elegant sheen. I added the sentiment from Petite Pairs, using my stamp-a-majig to make sure I got it in exactly the right position, and cut the whole thing out with my sharp paper snips. I'll be linking this card up with Make My Monday where wedding cards are this week's challenge; The Paper Players where the theme is Wedded Bliss; and CASology where the cue word is Shine. According to my youngest son, Wednesday was National Hug a Cat day! He announced this as he came bounding in from school and you could just see the tip of Tuppence's tail as she whisked out of the cat flap. My son's exuberant hugs are endearing but perhaps not if you're a cat! Oh, this is gorgeous, Vicky! This is simply gorgeous and so elegant! Your card is simply stunning! So very elegant! I love the way you stamped the beautiful flourish!WOW! Love, love, love it! So beautiful! Hope you have a great weekend Vicky! SO very ELEGANT, I think I am wanting the flourish stamp here!! -VERY inspiring Vicky! Thanks for joining CASology this week, just LUV your cards!!! Vicky! WOW! This is absolutely stunning! 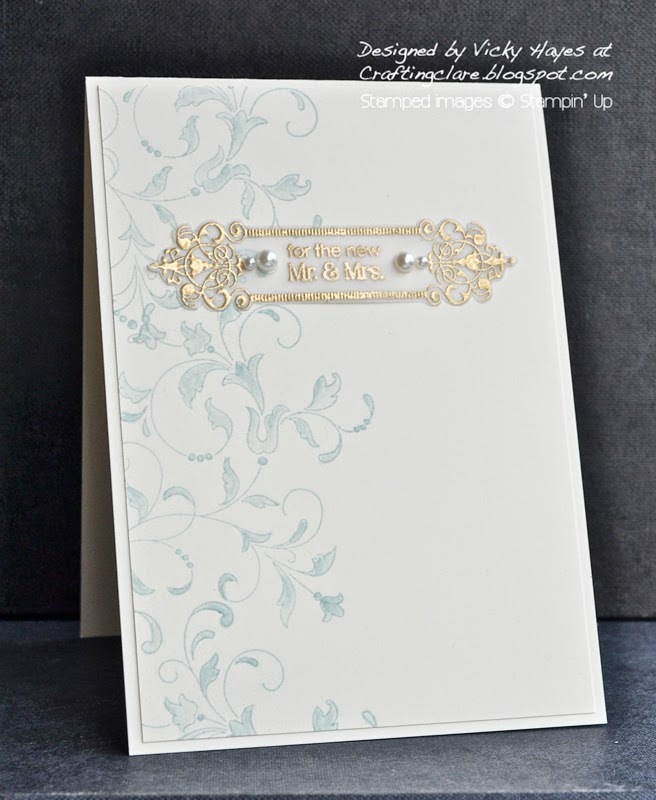 I love the light blue stamping paired with that shiny, intricate frame! So glad you joined us at CASology this week! Incredibly classy and elegant, Vicky! I love the intricately framed sentiment and the soft blue. Thanks for playing along with CASology this week! This is really classy Vicky. So elegant and beautifully designed. Thanks for joining in with our MMM wedding challenge.